Sacramento isn’t exactly known for its scenery, but as someone who makes his living photographing nature’s beauty, I haven’t found any place I’d rather live (okay, so maybe Hawaii is close). Just listen to this list of scenic locations I can drive to from home in four hours or less (clockwise from southwest to southeast): Pinnacles National Park, Big Sur, Monterey/Carmel, San Francisco, Point Reyes, Muir Woods (and countless other redwood groves), the Napa and Sonoma Valley Wine Country, the Mendocino Coast, Mt. Shasta, Mt. Lassen National Park, Lake Tahoe, Calaveras Big Trees (giant sequoias), Yosemite, and Mono Lake. Not only is each a destination that draws people from all over the world on its own merits, just check out the visual variety on that list. With a crescent moon due to grace last Friday’s pre-sunrise twilight, Thursday morning I checked my schedule and saw nothing requiring my immediate attention. I clicked through my mental location checklist for sunrise spots that offer view of the eastern horizon—Lake Tahoe and Yosemite would work, but they’re both crowded (and I have enough Yosemite crescent moon images anyway). Mono Lake? Hmmmm…. 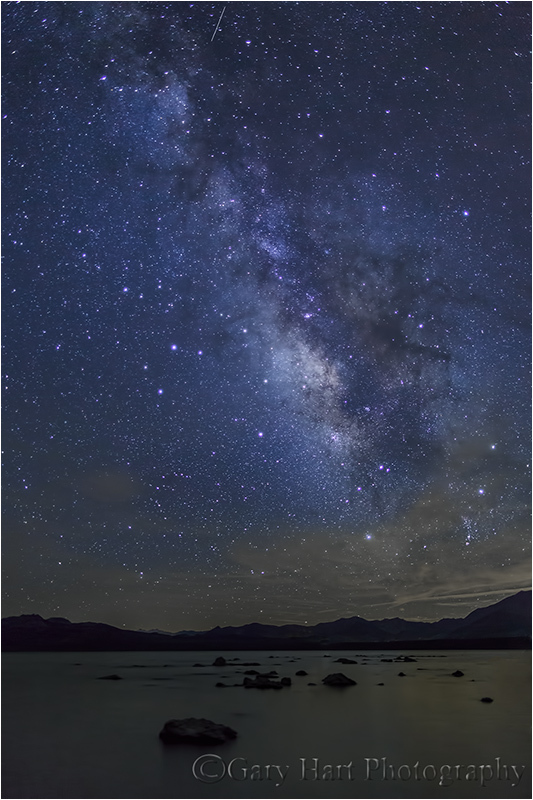 Not only would Mono Lake work for the moon, it should be dark enough there to photograph the Milky Way above the lake. Road trip! Within a couple of hours my Pilot was packed, and by early afternoon I was motoring up Highway 50. Aside from my photographic ambitions, another highlight of a Mono Lake trip is the drive itself, which takes me near Lake Tahoe, over Monitor Pass, into the Antelope Valley, and finally onto US 395 beneath the sheer east face of the Sierra crest all the way down to Mono Lake and Lee Vining. I pulled into town at about 6 p.m. and after a quick dinner at the Whoa Nellie Deli (not to be missed—look it up), I was off to the lake. Let the adventure begin. By far Mono Lake’s most photographed location is South Tufa—with great views of the eastern horizon, it certainly would have qualified for my sunrise shoot, but the best views of the Milky Way would require a view toward the southern horizon. Another problem with South Tufa is the crowds, even at night. Not only have I had to contend with light-painters there (sorry, not my thing), one evening I went down there and found the Japanese Britney Spears shooting a video. (That label is my inference—one of the crew confirmed that she was Japanese, the music sounded just like American Top-40 pop of which Britney was the current queen, and judging by the motorhome, full-size bus, two big-rig trucks, and 1/4 mile long cables snaking all the way from the parking lot to the lake, it was pretty clear this girl was a huge star.) So anyway, Thursday evening I simply opted for the view, peace, and quiet of Mono Lake’s north shore. Traversed only by a disorganized network of narrow, poorly maintained dirt roads, navigating here is difficult even with a high clearance vehicle. While my Pilot is all-wheel-drive, it’s not designed for off road and I need to take these roads with extra care. My strategy at each junction is to take the spur that trends in the direction of the lake, but over the years I’ve become fairly familiar with this side of the lake and had a general idea of where I wanted to be that night. So far I’ve not found a road that will get me much closer than a half mile from the lake, nor have I ever found an actual trail to the lake—when I think I’m close enough to something nice, I just park and walk toward the lake. It was about a half hour before sunset when I parked my Pilot in a wide spot near the end of a long dirt road. On most visits I’m out there navigating in the dark before sunrise, so it was nice to actually be able see beyond my headlights while hunting for a spot to shoot. Exiting the car I was blasted by the less-than-pleasant but tolerable smell that is distinctly Mono Lake. It’s there year-round, but seems to be worse in summer. With nothing to block my view, the lake was in clear sight. Lacking a trail, the route is pretty much a matter of picking a point on the shore making a beeline there. My first few steps dropped me down a short but fairly steep slope into the basin of the ancient Mono Lake. From there it flattens to a gentle slope, first through coarse volcanic sand, and then into a band of tall, soggy grass that eventually peters out into a soup of gray muck. Depending on the location I’ve chosen and the lake level at the time of my visit, the consistency of this muck ranges from damp sponge to shoe-sucking wet cement—this year’s muck fell closer to the wet cement side of the continuum, but my high-top Keens were up to the task. And thankfully, I found large areas where the mud had been baked solid enough to walk on without sinking. My plan for this trip was to photograph sunset, hang out lakeside waiting for dark, do an hour or so of night photography, return to my Pilot and sleep in the back (air mattress and sleeping bag, thank-you-very-much), then rise at 4:30 and return to the lake in time for the moonrise and and sunrise. I made it down to the lake in time to photograph a sunset that was nice but nothing special by Mono Lake standards. As I waited for dark a warm wind whipped the lake surface into a froth, and I soon became concerned about the thin clouds converging overhead—rain was not a concern, but it started to look like my Milky Way aspirations might be thwarted. Nevertheless I hung out (where else was I to go?) and was eventually rewarded when most of the clouds moved on to mess with some other photographer’s plans. While not nearly as spectacular as my recent Grand Canyon dark sky nights, there were far more stars than any city-dweller can ever hope to see. An occasional meteor darted into view (see the small one at the top of this picture? ), and a few satellites drifted overhead, but the main event was the Milky Way, which poured a river of white that spanned the sky from Scorpio in the south to Cassiopeia in the north. While Lee Vining has not quite achieved sky-washing megalopolis status, it nevertheless created an annoying array of discrete light of varying intensity and color that were more than I wanted to try to deal with in Photoshop. But I found that the farther east along the lakeshore I moved, the less these lights aligned with my scene. I was having so much fun that I stayed out there until the Earth’s rotation had spun the Milky Way into closer alignment with the Lee Vining “skyline,” sometime after 11:00. By then I really had no idea how far east I’d wandered, so as I trudged back to the car in the pitch black I was extremely thankful (and self congratulatory) for the foresight to have mentally registered my bearings in daylight. While my headlamp guided each next step and illuminated the ten-foot radius of my dark world, navigation was solely by the North Star, which I kept off my right shoulder. I had no illusions that this method would allow me to pinpoint the car in the dark, but my hope was to get close enough that clicking my key fob would activate my horn and lights. For quite a while the key was answered by nothing but crickets, and about the time I started worrying that I’d miscalculated my position and would be spending the night in the mud with the flies, my car flashed and beeped about 100 yards to my right. Hallelujah. Not exactly a bullseye, but close enough. The next morning came much too early, and while I didn’t get any moon pictures that made me particularly happy, the sunrise was off-the-charts and (along with the Milky Way) more than enough justification for an eight hour roundtrip and less than four hours of sleep. But that’s a story for another day. it really is unfair, you have all fun ! Gary- I love the spontaneity! BTW- I finally woke up and got a RRS TVC 23/BH40. Perfect heighth, light, sturdy, and love the Head & Quick Release. Thanks for your direction!!! For me this post was hugely entertaining. Others may have some of the knowledge and insights you display, but I don’t. Your exertions and meanderings, peppered with overall perspectives and colorful detail, make the post come alive, making me wish I had been there with you. I will forward it to my landscape photographer friend Lowell Flanders, even if he may have already read it as he turned me on to your blogs. Many thanks for making my morning a more enjoyable one. Any chance of shooting the Milky Way at the Grand Canyon Workshop in August? Hi Scott. I’ve been thinking about it. It’ll need to be from the North Rim—I tried it from Bright Angel Point last year but found the South Rim lights a major problem. The other problem, and it’s not trivial, is the darkness in the black hole that is the Grand Canyon on a moonless night. I found that even at f2 and ISO 6400 I wasn’t getting a lot of usable detail out of the canyon. But I’m planning to at least revisit the idea this year. I need to get back there and do some exploring.